Our KCACTF participating entry featured strong ensemble acting and creative student designs for a challenging script with dozens of characters and nearly 60 scenes. A touching play, beautiful set, wonderful theatre, and my first time in ages to direct an Equity cast. Hurricane Harvey may have changed our venue, design, and schedule, but we had the last laugh with this uproarious Russian comedy. The first musical experience for our Romanian cast and audiences was part of my second Fulbright grant and produced as the showcase for the first-year graduate actors from Babeș-Bolyai University in Transylvania. Our second brush with Mee and a final bow for many of our seniors, who sang, danced, and reincarnated part of a “lost” Shakespearean play. Using verbatim audio translations, our company transcribed and adapted Grabovci’s touching play for the inaugural production (and American premiere!) in our new, student-run theatre. Five national awards from the Kennedy Center for our high-tech but low-budget venture into American Expressionism using our new projection software and air-brushed makeup. Senior Ryan Brazil’s sound design represented the U.S. in the college division at the 2015 Prague Quadrennial. Our interdisciplinary, multi-media season opener featured the brilliant choreography of graduating MFA dancer Travis Prokop, who introduced many of our theatre majors to modern dance. Our department’s first-ever, full-length puppet show, all student-designed and built in Bunraku style and wearing costumes crafted by Kris Hanssen’s pattern-making class. As part of my first Fulbright grant, this Albanian-language play about American soldiers returning from Vietnam was the “diploma production” for the male actors graduating from the University of Prishtina in Kosovo. My first Shakespeare at Sam Houston was fast, furious, and fun…and decidedly Balkan in its music and motifs. I adapted and abridged the text to run just under two hours. Challenging material and a difficult process, all saved by an exceptionally talented cast. Double casting for the brides and grooms: lead role one night, cameo role the next. A joyous celebration of the possibilities of educational theatre, all done on a $500 budget. An independent project and great showcase for several of our finest actors who had “fallen through the cracks” during casting. A found-space production performed at 16 different interior and exterior locations on our campus. At times, the audience had to run to keep up with us! Loosely based on the life of Artemisia Gentileschi, my first main stage production at SHSU featured chiaroscuro lighting techniques along with region award-winning student costume and scene designs. For my first year at Sam, I proposed and produced an independent project. I cast three men to play the title character and three women to play his wife. All of our costumes as well as our set coverings came from one bolt of cheap muslin from Walmart. 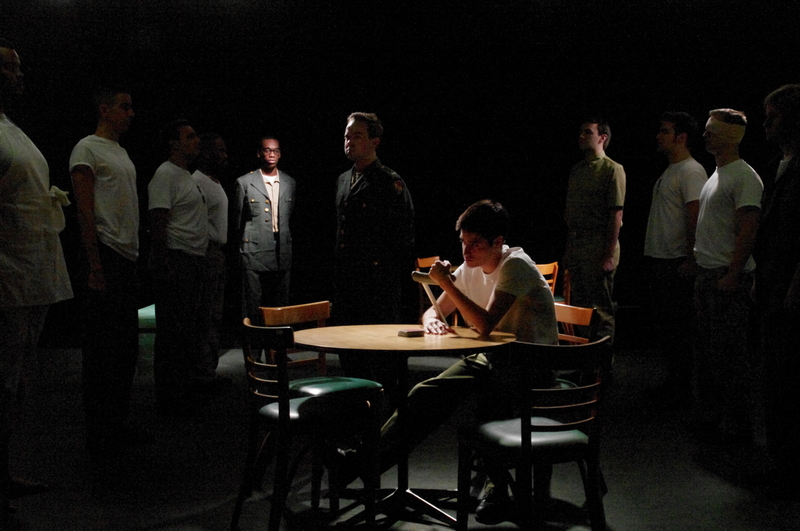 This was my final production at Rockhurst and my only one to place the entire audience onstage with the action. Intimate, intense, and bittersweet. We “devised” LOST as our response to the Iraqi War; we pointed no fingers but, instead, focused on the effects of war on women and children. The multi-media piece featured student-shot and edited video along with modern dance choreographed by Susan Rieger. An exploration of the effects of mental illness on creativity, this was presented as an installation in our school’s new art gallery and later was invited to the Region 5 Festival.